Life Document | What Matters Most? Of all the questions invented, I believe this is the most important question ever asked. Most people tread life blindly. Their lives symbolically start when it’s time to choose their career. But what do high school students know about life? Not much. Yet they “sense” that the field that they will choose is going to be the direction of their lives. “I chose IT, I’m gonna die for IT!“, “I chose medicine, I’m gonna be a doctor forever“, etc. This “sense” is being “confirmed” when they hit their workplace. Yet somewhere down the road they walk, most of them will ask these following questions that vibrate into the eternal value placed in their hearts. It boils down to that one big question. Some people shrug it off and continue with their lives or cover it with the deception called “enjoyment”, all the while leading them to a mediocre predictable lives that would last 20-40 years until their retirement. Poor and rich alike, they may be struggling inside. They never had the courage to question what they were truly made for. The internal struggle begins when the right person is doing the wrong thing at the wrong time. They will feel it. Their lives will be out of sync with who they really are. Sometimes it’s a good thing that life knocks them off to be lost and confused. Or else they wouldn’t find something valuable. I started questioning when my life’s order got out of hand. Career crossroads, broken dreams, cut connections, hurt people, unhappiness and confused direction. My friend told me that the reason why I was unhappy is that I don’t have contentment. My other friend told me that I think too much. I listened to them, but this one thing stubbornly bothered me. I desired service but I didn’t have the attitude of selflessness and humility. Yes, I am not content of being selfish and little. I believe all men want to be great. I also wanted to share but I got too little or nothing to give. I didn’t realize what the question really was until it hit me at my worst. The question was not what I wanted to do with my life, but rather what God wants to do in my life. I tried exhaustingly to escape His calling but it kept on haunting me. Gold and silver shine before me, pleasures entice me, responsibilities call for me but I wasn’t really heeding His call. A life of servanthood and purpose and a life of meaning is what I want. But I couldn’t do it when I prefer to be alone because it’s a lonely path that paralyses me. It also doesn’t synchronize with the steps of God. I needed channels of love – family, friends, passion. So maybe, just maybe, it’s time to take risks, get out of the cold boat and trust His hand. 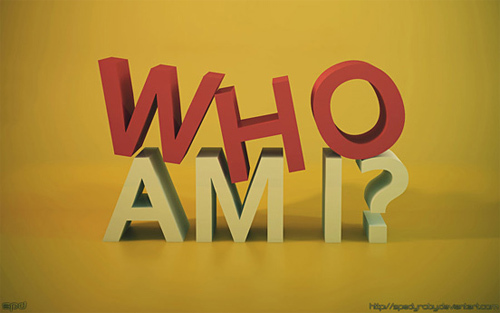 “Who am I?” is a question of identity. I may do what I want to do. I may try a lot of endeavors, but if I don’t match that which God has in mind for me, then I may only be wasting my time. The question presents a daring journey with Him, to show me my specific purpose. My soul inclines to nature, family and teaching. Maybe this is what He was telling me. I may be in a personal crossroads today, but if I just follow His will, and trust His guidance, then I might save myself from unnecessary detours. Scripture is very clear that all we like sheep, have gone astray. One crossroad to another and one wrong step, you’re lost. It’s funny how people’s characteristics are like that of sheep’s. They are foolish, slow to learn, demanding, stubborn, straying, unpredictable, copycats, restless, dependent and they are all the same. In short, they need a “rod and staff” kind of guidance, or they may become a feast of wolves. We all need a Shepherd. I am a sheep that has the tendency to go astray. But with the Divine Shepherd, who am I? I am the child of God, with the power of Christ in me. If I have that unlimited connection with God anytime, and have that infinite tap source of His power, why not utilize it? I understand that the biggest problem of mankind is forgetfulness. Adam fell because he intentionally forgot, so did the other characters in the Bible. But if I just have to remind myself everyday of who I really am in the sight of God, then I can be more than conqueror. I am God’s beloved son that He chose to lay His life for me to live life abundantly. I am His vessel for blessing. I am a mansion keeper. I am rich in Him. I am a steward of His wealth. I am kept in the palm of His Hand. I am confident in His Power. I am secure in Christ. 6 Billion People! What Am I For? Life Document is the author's recollection of lessons on the basis of biblical principles, personal convictions and life observations. This blog has evolved from the author's everyday contemplation through his notepad and has served as his marker for the growth of his faith and wisdom.